I want to premise this post with stating to all of you who don't know that I am a die-hard Syracuse Orange fan. Having graduated from SU in 1997, I remain a loyal supporter (and will be attending the annual Syracuse/Georgetown game next month). A few weeks ago, the university announced that Junior guard Eric Devendorf (one of our top three players) would miss the rest of the season due to his off-court conduct. This news came during a 9-0 run to start the season for the Orange. On November 1st, Devendorf was charged with hitting another female student . There were reports that she tried to run him over with her car before the physical altercation. 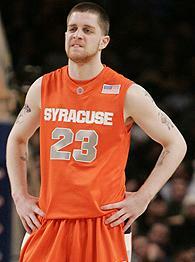 Today, Syracuse officials have decided to change their stance and suspend Devendorf immediately for six games, after which he can apply to be reinstated for the rest of the season. Now while I am very much against abuse towards women of any kind, the facts in the case were a little gray on both sides. Along with coach Jim Boeheim, I thought a full year suspension was a little high for an incident that did not even garner any punishment from the local police. I'm not a big fan of the way #23 acts on or off the court (the word PUNK comes to mind), but having him for the Big East season and (hopefully) the NCAA tournament will be critical to the team's success.